Back when the holiday season began, Ryan and I made a pact to step away from home projects for a few weeks. We had been going nonstop all year, so it was nice to walk away and recharge. Now, we’re ready to get back at it! 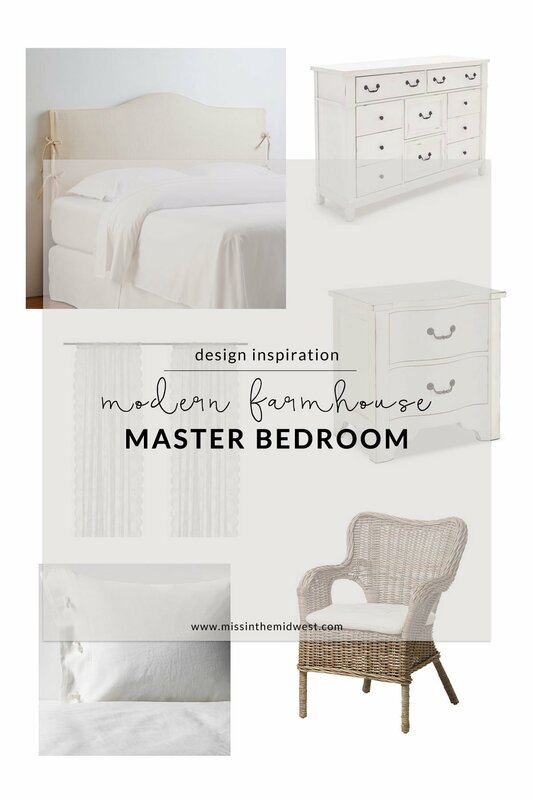 First up on our agenda is redoing our master bedroom, so I spent many a nights on Pinterest during our holiday break to research modern farmhouse master bedroom design ideas. The funny thing about our master bedroom is it actually was the first room that we attempted to renovate when we moved in. We painted the room, including the trim and windows, all in one weekend, bought a new light fixture, and called it a day. I’m literally laughing as I sit here writing this looking back on how clueless we were. No amount of paint (which is getting changed, big surprise) was going to fix the real issue – our furniture! So obviously, the biggest change this room will see is our furniture! Our hope is to sell our current set – except our mattress/box spring – on Craigslist to offset the cost of our new stuff. I’ve seen other people and bloggers have success with this tactic, so I’m keeping my fingers crossed that we have the same luck. We know that we want an upholstered headboard. A lot of my research for modern farmhouse master bedroom design ideas came back with iron/metal headboards, but I still like that look more for a guest room. Plus, both Ryan and I do a majority of our reading while sitting up in bed, so we want something that is comfortable against our backs. Neither of us were too keen on any of the tufted headboards that we found, so I was thrilled to find slipcover headboard options. This one from Birch Lane is my favorite because of the ties on either side. It adds that little bit of farmhouse charm. We are just waiting to receive fabric swatches before we make a final decision. Our soon-to-be dresser was the easiest decision. The construction is the same high-quality as our current dresser but with the right look. I love the hardware and light distressing. We probably also will choose to go with white nightstands. 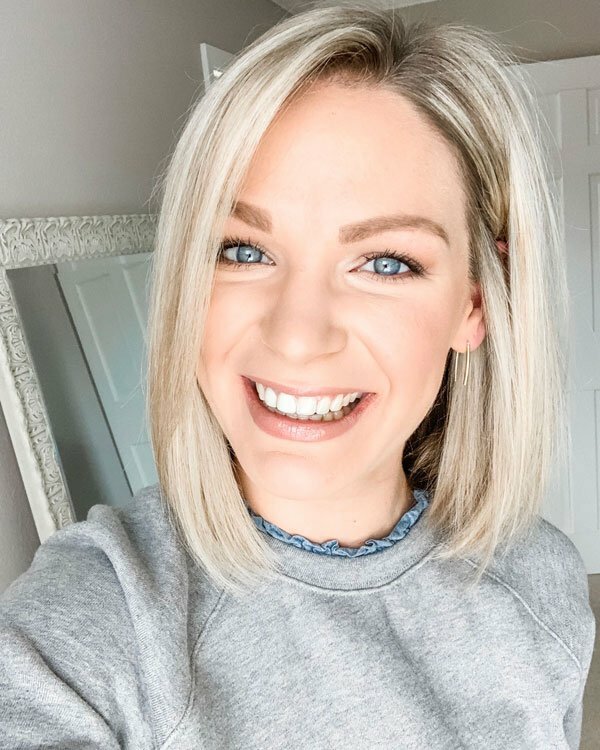 Let’s face it – I love white! 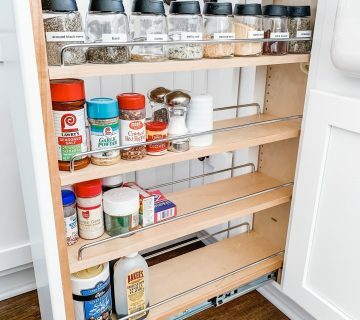 It’s easier to add color, pattern or other rustic touches with a blank slate. And of course, we can’t forget about the details and accents! Don’t you think some lace curtain panels would look dreamy? We bought this bedding ages ago, and I can’t wait to finally have it out! I also hope to hang up new light fixtures and add a corner accent chair among other things. 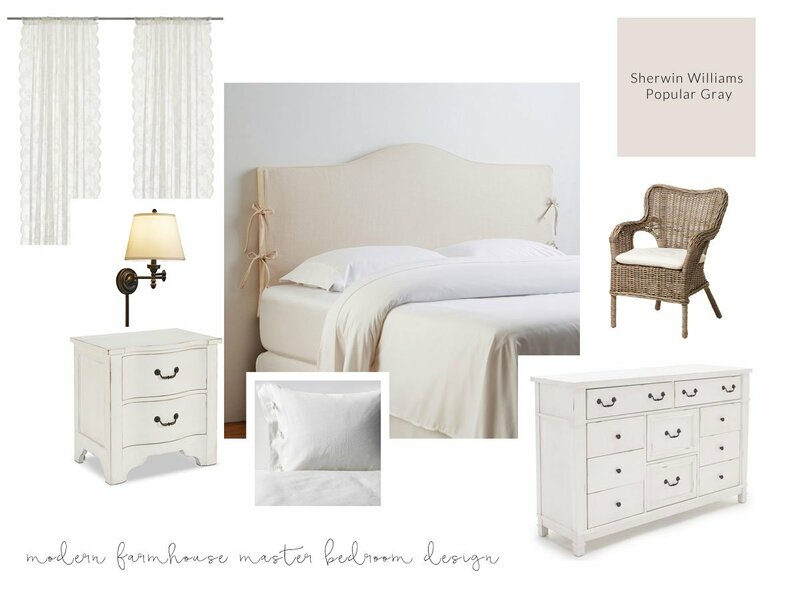 So, those are my modern farmhouse master bedroom design ideas thus far. It will be fun to kick off the year with the renovation of a space that is meant solely for Ryan and I (Finn, too!). I can’t wait to see the final product! Definitely feel you on that, my furniture is all dark throughout my house and I keep trying to brighten it up. I think if I suggest something else in white to my husband, he’s gonna blow:). Love that bed! Haha, I remember it took me a while to get Ryan on the white furniture train. But now, he totally gets it! 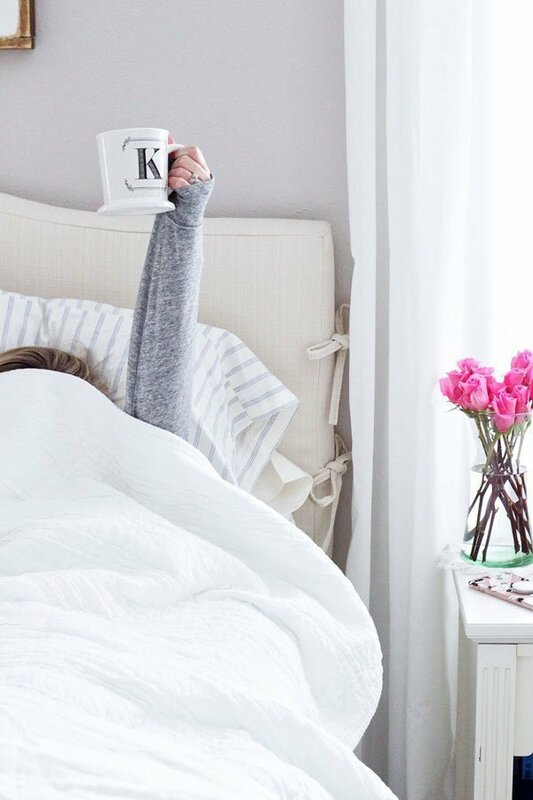 We are loving that headboard, too! Oh wow, wanna come over and do my house? I bet your place looks amazeballs, love this aesthetic. It’s crazy how furniture completely changes a space- even going from a darker color palette to light! I love the pieces you guys have picked out! Thanks, girl! I really think lighter furniture will make all the difference. Love this master bedroom inspiration! So our dresser was actually Bill’s old dark wood dresser he has had for years that he refinished with an antique white color and new hardware. It was a project I asked him to do last summer and I was so happy with the outcome! We bought some antique white nightstands off of amazon with similar hardware and now they look like a set! And we have that SW paint color all over our house! It’s my favorite! That is so awesome! We thought about just painting our current furniture, but we weren’t convinced that it would solve the issue. I will have to check Amazon for nightstands, thanks for that tip. And, yes! I remember the pictures of your house with that paint color, and that’s what sold me on it! I love the inspiration boards and ideas almost as much as the finished products! Love these ideas! You definitely have to take some time off when it comes to the house projects to recharge! Can’t wait to see what you guys do with your bedroom – I know it’ll be fabulous! I’m with you girl! I’m all about the light, bright, and whites! I can’t wait for the day we can decorate and pick out furniture. I will be coming back to all of your posts! Yay! I love to hear that. Your future home will be fabulous, I’m sure. slipcover headboards?! that is brilliant. i really wanted the upholstered look as well, and then ultimately went with something completely different. the bed we got (we don’t have it yet) has cubbies and drawers and i was like but how will we sit up and read? and KC was like.. we never do that and i guess i just thought we did haha but we really don’t. i like to read on my side with my kindle, he reads on his stomach. if i am reading a real book, i’m on the couch. very odd 🙂 i really like everything you’ve pulled together, i’m sure it will all look amazing when you’re done. good luck selling your furniture! Right?! I’m not sure if it’s easy to find other covers for the headboards, but at least I can take it off and wash it if needed. We are between the one that I put in here and another one from Target. I bet you’re so excited to eventually have your new bed – I remember seeing the picture of it. The kitties will love it! And, I love how everyone has different reading places/habits. I love this look so much! The lighter colors are going to be so awesome in your master bedroom, and I love the upholstered headboard too! That’s what’s in our guestroom and I love it so much! Thanks, friend! We are so excited to get started! Laughing as I read this because my design tastes changed so much too and are now so similar to yours. So different than we first married 7 years ago. Love where you are headed with your master now! I love that we share a similar design aesthetic and have gone through the same stuff with it – it really is funny how things change! 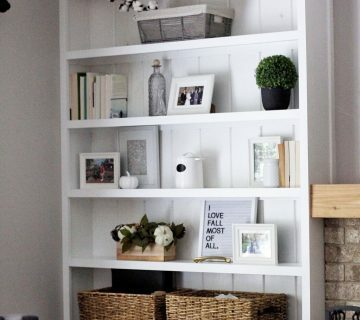 I used to not be a fan of the farmhouse look and now I’m obsessed! I love your picks! Our bedroom furniture is all black too and I’m ready for a makeover! Awe, thank you! It’s definitely not for everybody – I try to keep it a little more on the modern side, but I admit that I’m slowly adding more rustic touches everywhere. The black furniture is just so depressing to me lately, lol! Love all of your picks and can’t wait to see what you guys come up with! We have a wooden headboard and it’s definitely not super comfortable for reading or sitting up in bed without having to arrange a million pillows. That’s what ours is, too! The only thing I like about our current headboard is that it’s a bit oversized, so it’s super tall. But, I’m definitely looking forward to the upholstered feature. I love all your choices for this room, it’s going to be really pretty! 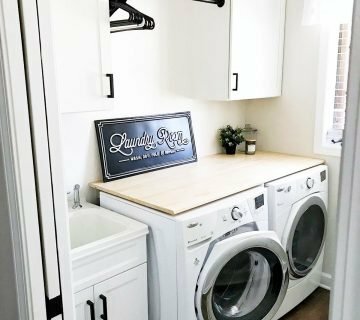 You keep inspiring me to change my entire house! Thanks, lady! I think we all feel that way this time of year when the Christmas decorations come down – our house is a wreck right now!